As I am sure all of my followers/readers from the UK will know this weekend we have been given a whole 4 days off work (all of us that don't work in retail that is, although double pay woop!) So why four days off work you ask? 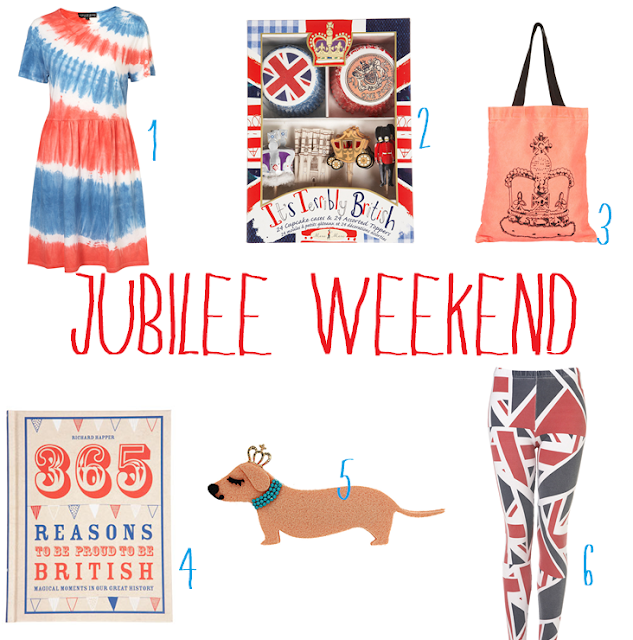 This weekend marks the Queens Diamond Jubilee as we celebrate her 60 years on the throne. Now I will admit I'm not the biggest royalist, and I'm one of the few that don't have the weekend off work. So why do I care? Well I love the concept of tea parties, tiaras, cake, bunting and celebrating Britain! Above are my favourite pieces from the high-street that will be perfect for celebrating. Originally I was going to pick a selection of pieces from different high-street stores; however Topshop have out done themselves so much that i never made it past their website! I'm not British, but I do love that dress!! thanks so much for visit my blog! we could follow each other? i already follow you! hope you follow me back!